Steve Roach – the master of space and time altering atmospheric soundworlds – has created another spellbinding look into our primordial unconscious memory bank. The music is best described as primeval innerspace deep ambient. early man dreams in an ancient landscape of bubbling pools and marshlands, verdant arroyos and monolithic rock formations. Cave paintings and primitive [memories come to life in a slow soul-dance of evolutionary magic. 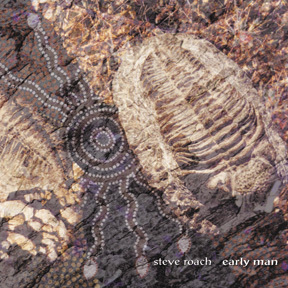 The accolades from press and listeners alike tell that early man belongs to Roach’s classic body of work which includes Dreamtime Return, Origins, The Magnificent Void and last year’s quietly successful Midnight Moon. A day in the life of Early man…. There’s movement up ahead, a lone figure on the edge of the abyss, teetering on the brink of darkness. He is the First Soul, the Lonely Wanderer, the early man, and digital aural guru Roach has provided his evolutionary soundtrack, sounds that upon observation are situated in time like millennia-old fossils waiting for the unearthing. Roach has travelled down these prehistoric roads before, but never like this. This is his archetypal release, a staggering sonic snapshot that time forgot. Originally released as a special limited edition — presented between 2 pieces of slate on manifold Records — early man is now a two-disc mammoth. Disc One is a hour plus journey into quantum pulse and barren tones, as myriad noises chigger about and nestle within the speaker fabric, as scuttling rhythms assume life and eke out footprints in the prehistoric sediment, as immersive electro-tectonic shifts map out the topography newly emerging underfoot. The 71 minute Disc Two morphs the drones into whispering, quiescent, near-subtle beat patterns and random incidences, as Roach’s daunting electronic palette yields a colorful bounty of ancestral dawns, preening skies, vivid earthen architecture. early man is, simply put, a stunner.